Who makes these sensors and displays? Click here. Every aviator is taught and knows the critically important “ Angle of Bank v. G-Force” curve. 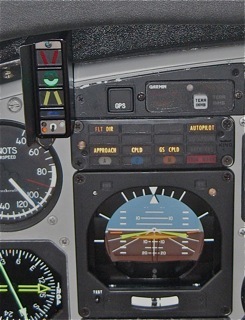 But there is not a pilot flying who has the ability to compute his constantly-changing margin above stall (a Vref, or an Optimal Alpha Angle) especially when operating with varying loads in a bank on a hot muggy day at altitude. An Alpha-sensing system can do that easily and accurately in real-time. Operationally, Alpha is critically important; accordingly, most heavier aircraft have some sort of Alpha-sensing system on board. The FAA has known the importance of Angle of Attack instrumentation for decades, but -- only recently -- low cost modern electronics have become available to do the job -- affordably -- in light aircraft. This was published by the FAA in 1964. Clearly, the FAA would have enthusiastically encouraged installing AoA instrumentation in training aircraft back then, but they publicly lamented its affordability. (The underscores are Jim Osborn's; he was studying for his CFI rating). Today, we can install a highly-accurate EARLY WARNING of STALL AoA system for well under $1,500. As we were all waiting for a simple AoA system to be developed, the crashes keep happening - event to highly skilled aviators. INSTALLATION? It's easy. Read this. 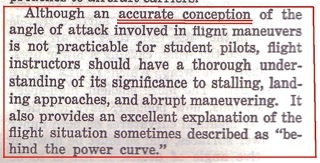 For most aircraft it's a "minor alteration"
“Stall warning devices are …binary or ‘On-Off’ devices that give the pilot no indication whatever on how close his wing is to stall….one or two degrees [of angle of attack] below stall, a [stall warning device] is still speechless, mute. 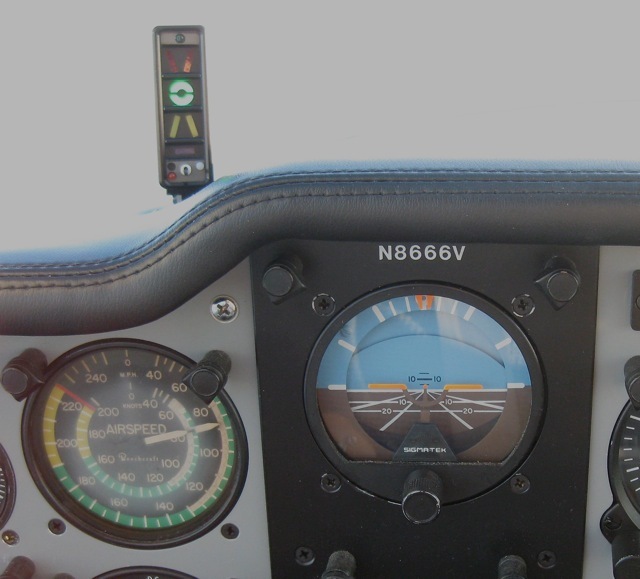 So...What does an Angle of Attack instrument look like in flight? How does it function? Here's one way to fly with a Alpha display. Works for me, yet I have no idea if it's the best way. So, I'd welcome a better method. Three pilots who know more than I helped revise/expand my thoughts for the ABS News November/December 2015 issues. What do you think of our methods? Who makes this Alpha Systems "Legacy Display"AoA that provides such a precise early warning of impending aerodynamic stall? Who else makes these devices? Click here. October 2015. see the FAA's video analysis of three AoA systems, by the FAAST Team. ...and...in October 2015, they updated the FAA Currency Requirements and Guidance for the Flight Review and Instrument Proficiency Checkguide with a new emphasis on AOA (see page 16, Paragraph 4-3d) How To Review AoA during IPC flights. The FAA published an April 2015 AOA Addendum to the Instrument Flying Handbook. Short and to the point, it should be truly valuable to any pilot. Read the full FAA inFO document here. Earlier...in an extraordinarily helpful December 2011 FAA clarification letter, the FAA Small Aircraft Directorate explains that installation is a "minor alteration" on the vast majority of light general aviation aircraft. A summary of our Flight Test Plan to check out the Legacy AoA system. Download a PDF of our entire Flight Test Plan. Fair warning: It's quite detailed. Read our Flight Test Report, in summary form which is easy to understand...or download our Flight Test Reports, each greatly detailed. This research was initiated because of the tragic loss of four great men. We intend to stop these crashes from happening, so -- in memory of these four friends, we hereby place these reports in the public domain. King Air 90 Blackhawk - "Dual Eagle AoA"
A discussion of Flap Bias (whether it’s needed or not) in considerable detail. I’d be very interested in hearing what you think of any or all of this discussion. Just click on the email link at the bottom of any page and please share your expertise. Analysis of recent Stall/Spin accident reports. Maybe I'm blind, but the Stall/Spin accident data screams at us to install AoA-sensing secondary early stall warning systems (fleet-wide, I'd suggest) ...AoA systems that are as reliable and affordable as the Legacy. These DO NOT have to be highly-complex or costly devices to provide an early warning ot stall. V7. More web-posts by pilots using AoA displays. Reasons. Applying a bit of reason to the Stall/Spin accident reports. ...but the cost of a reliable AoA has plummeted and the "accurate conception" is practicable now. Today, an effective and highly-accurate EARLY WARNING of STALL AoA system is available for well under $1,500. The least expensive one we have found is about $550, and it works well, too. INSTALLATION is easy. Read why and how. ... and a few examples of routing the sensor lines. and here is a list of all the AoA manufacturers that I'm aware of. You love your family? You take care of your passengers? Of course you do. Don't forget that a reliable and effective AoA display that gives a RELIABLE and EARLY warning of stall is available for well under $1,500 plus a few easy hours of installation. A brief video of the individual Legacy segments from Cruise to Stall in level flight in a Bonanza. Then we followed up in the same Bonanza, checking to see if we successfully set OAA for 81 (we did, which gives us an OAA display range of 81-87 MIAS). and then verifying that it was, indeed, a range of OAA being displayed. Final Approach to touch down in a Bonanza with its OAA calibrated to 81 MIAS (a green donut range of 81-87 MIAS). Interesting... but that was in level flight. Any Airspeed Indicator will give us all we ever need....in level flight. But here's a Bonanza in very steep banks and pitches and THIS flight regime is where the AoA shines, as the ASI is telling lies in the steepest of the banks. I realize that we all know that, but it's MUCH TOO EASY to forget it..as VERY EXPERIENCED and VERY SKILLED aviators still do, with tragic consequences. Our second Legacy installation and Test Flight series was in the King Air C90 Blackhawk. We'll skip the calibration process as it's identical, but we did set the King Air for 1.3Vso (Full Flaps with Gear Down). We expected to see a smaller stall margin and we did, but there is plenty of "early-warning-of -stall" remaining...so this King Air will stay set for 1.3Vso . Landing in a King Air C90 from downwind to the rollout. What did we miss? Ask us, and we'll try to film it for you. (Acrobatic flight? Not in these two aircraft. Inverted? Nope.) What else would you like to see? "This Needs Doing. I'll help"
said Bill Hatfield of Turbine Conversions Ltd. ... just as all the others did too. Disclaimer: The information provided in this website and AoA/Aircraft portion is provided free of charge. All information provided on this web site is provided 'AS IS'. No guarantee is provided for the accuracy of the information or the application of the information provided herein. I accept no responsibility or liability with regards to the accuracy or currency of the information provided. By using, reading or accessing this web site, you agree to be the user of the information provided. The user accepts full responsibility for all information provided. Although I try to keep the information on this site as accurate as possible, there is no guarantee that the reference materials or the material on this site is correct. This information is provided entirely in the spirit of helpful cooperation.